Every Black History Month we celebrate our Black athletes, civil rights leaders and artists. But too often we overlook our legacy as Black entrepreneurs, business owners and executives, despite having just as deep a legacy in those areas. 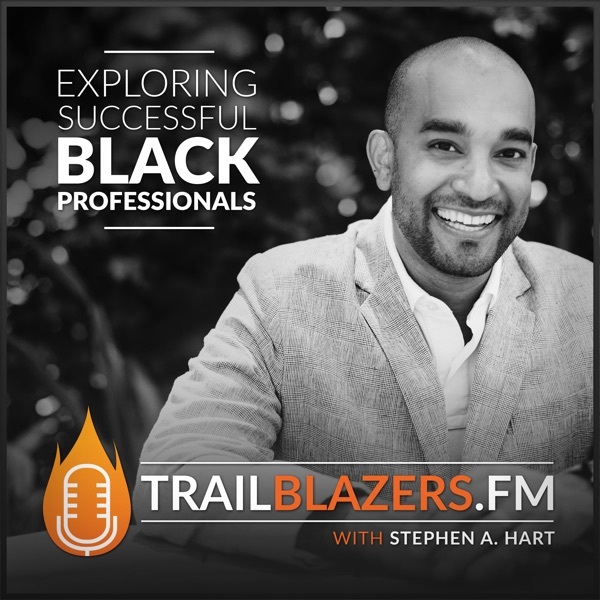 Today, Alfred Edmond Jr. returns to Trailblazers.FM for his third feature and second of what we hope to be an annual episode of Alfred sharing stories of our Black business legends. Alfred is the Senior Vice President and Executive Editor-at-Large of Black Enterprise. Some time ago, Alfred brought it to my attention that there's often very little conversation about black legacy in business. That fueled my invitation to him to join me on episode 107 for our first Black business legends episode. That episode has gone on to become one of our most downloaded episodes ever on this podcast. Here are a few of the people who’ve had an impact on the Black community and Black business, and in many cases changed American business in many ways: Barry Gordie Tom Burrell Comer Cottrell Cathy Hughes My ask today is that you’d share this episode with your family, friends and others in the Black community. If you're posting to social, please use the hashtags #blackbusinesslegend and #missionfuel Let’s be reminded of those who paved a path for us. It’s on us to keep these business legends top of mind and ensure they are never forgotten. What are the laws of creating wealth? Our featured trailblazer today is Dr. Dennis Kimbro. He’s spent his entire career interviewing peak performers all over the world, and gleaning the best ideas, strategies and success principles from their words. He’s heard the same things enough times to know that all people who succeed tend to follow the same path and that all people who have not succeeded yet tend to fall into the same pit over and over again. Dennis Kimbro is a best-selling author of five books, writing partner and master trainer for the prestigious Napoleon Hill Foundation, and is on the faculty at Clark Atlanta University School of Business Administration. He is a recipient of the Dale Carnegie Personal Achievement award. I need your help right now to share this episode. Someone you know needs to hear today’s message. Learn key strategies to building wealth and legacy despite an individual's starting point. Our featured trailblazer today is Jay Morrison. A successful entrepreneur and business mogul, Jay Morrison is the CEO and founder of several organizations including the historic Tulsa Real Estate Fund, and the Jay Morrison Academy, which was featured on Inc.’s 2018 List of Fastest Growing Companies. Beating the odds after growing up in poverty, dropping out of high school and serving time in prison for drug trafficking, Jay was able to turn his life around by breaking into real estate and becoming one of the industry’s biggest influencers. Jay is truly on a lifelong mission to bridge the wealth gap and provide accessible education and business opportunities to those who need it most. I need your help right now to share this episode. Someone you know needs to hear today's message. What does being financially independent mean for you? Our featured trailblazer today is Jamila Souffrant. Jamila Souffrant is a podcaster, writer and founder of JourneyToLaunch.com where she shares her journey to reach Financial Independence and helps others do the same. As a money expert who “walks her talk” she helps brave Journeyers; gain clarity around their finances and create an actionable plan to reach their goals. Because of her money habits, Jamila and her husband saved $169,000 in two years and are debt free besides their mortgage. She is also a mom of three young children and currently lives in NYC. Her mission is to teach, inspire and help others reach Financial Freedom & Independence through her platform. The Journey To Launch podcast was named one of “27 Podcasts You Need To Start Listening To In 2018" by BuzzFeed. Jamila is also the resident financial expert on a weekly segment on News12, the most watched local TV news-station in NYC and has been featured in other notable media outlets such as Money Magazine, ESSENCE Magazine, TIME, Business Insider, Refinery29, CNBC & CBS I need your help right now to share this episode. Someone you know needs to hear today's message. It doesn’t matter where you come from; it doesn’t matter where you start; it’s about us growing and learning things so we can move forward. It's the first episode of 2019 and today we begin a new Wealth Building series. It's the second year we're committing our first six episodes to talk about wealth. The reason we begin here, is that our wealth gap is so wide. So much so, that a recent study said it'll take 228 years, if ever, to get median black households to the level of wealth median white households own today. And if nothing else changes, we're trending to ZERO wealth by 2053. Those warning flags are why I began having more direct conversations about the topic of wealth, in hopes of educating and giving our community some practical advice to help reverse this cycle and begin to close this gap. But I need your help right now to share this episode, because more black families need to hear this content and take action today if we're ever going to effect real meaningful change. Our featured trailblazer today is Chris Hogan. Chris Hogan is a #1 national best-selling author, dynamic speaker and financial expert. For more than a decade, Hogan has served at Ramsey Solutions, spreading a message of hope to audiences across the country as a financial coach and Ramsey Personality. Hogan challenges and equips people to take control of their money and reach their financial goals, using The Chris Hogan Show, his national TV appearances, and live events across the nation. His second book, Everyday Millionaires: How Ordinary People Built Extraordinary Wealth — And How You Can Too releases January 7, 2019 and is based on the largest study of net-worth millionaires ever conducted. In this episode you will learn: What the term net worth means? And how net worth determines if you're a millionaire. What 74% of millennials believe about inheritance. Five attributes and habits of millionaires. The #1 thing millionaires used to build wealth. Why Chris encourages paying off your mortgage quickly using a 15 year fixed loan. Dr Mildred Peyton talks about bullying. Her message is applicable to kids and adults alike. You’ll come away understanding that our pain can drive us to help others or bring about some positive change. Dr. Mildred Peyton is a bullying survivor, expert, and a children’s author of two books, A Bully on the School Bus and Sophia Writes To Her Bully. Despite having a Ph.D. in Human and Social Services (with a concentration in Social Policy Analysis & Planning), a Bachelor's degree in Social Work and Sociology and a Master's degree in Counseling Psychology, she still experienced bullying firsthand both on the job and in her role as a mother trying to protect her children. As an expert on bullying, she speaks from her heart and real-world experience. She knows the denial, pain, frustration, embarrassment, guilt, and sometimes even downright rage that consumes you when you or someone you love is being taken advantage of. Dr. Peyton guides her clients as a consultant and trainer through the process of joining her on the other side of establishing and maintaining a safe and healthy workplace and school environment to ensure greater success for all. Also included in her work, she provides one-on-one guidance to parents, students, and employees who are experiencing bullying and harassment. Lastly, Dr. Peyton's doctoral research study entitled, Exploring the Meaning of School Bullying Among Parents of Victimized Children, along with hands-on educational training in facilitating focus groups and mentoring programs for students experiencing bullying and harassment are among some of her work which has demonstrated her commitment to cultivating safer schools and helping students. As for workplaces, Dr. Peyton's personal experience working in a toxic work environment inspired her to support and work with employers in creating and maintaining healthy workplace atmospheres where all employees will feel valued and respected. Known as the Corporate Ally, Denise Harris empowers executive women to go from plateau to breakthrough. A dynamic and vibrant speaker, Denise Harris will give you the power to amplify your strengths, strategize to win and emerge as the highest version of yourselves. Scott is the Managing Director of Dream Entertainment Limited, the company behind Jamaica’s largest and most impactful music festival – Dream Weekend, the country’s biggest Carnival Mas Band – Xodus Carnival and in 2019 will execute the Dream Weekend Cruise – Jamaica’s first owned entire cruise ship charter. One Action To Blaze Your Trail: Just do it! Most people know what they want to do deep down. If you're really passionate about something, you just have to go out and do it. Don't be reckless, still be calculated. If you have a dream and a passion, at least get started on it. Thanks for Listening! Please help us expand the reach of this podcast. Follow and share the podcast with your friends on: Twitter: @TBPod Instagram: @TBPod Facebook: /TBPod If you're on Apple Podcasts, help us reach more trailblazers by leaving us a 5 star review! Ratings, reviews and subscribes are extremely helpful to expanding our reach within the Apple community. This year was truly successful in so many ways and I want to highlight the 3 things that aided in my success for 2018.